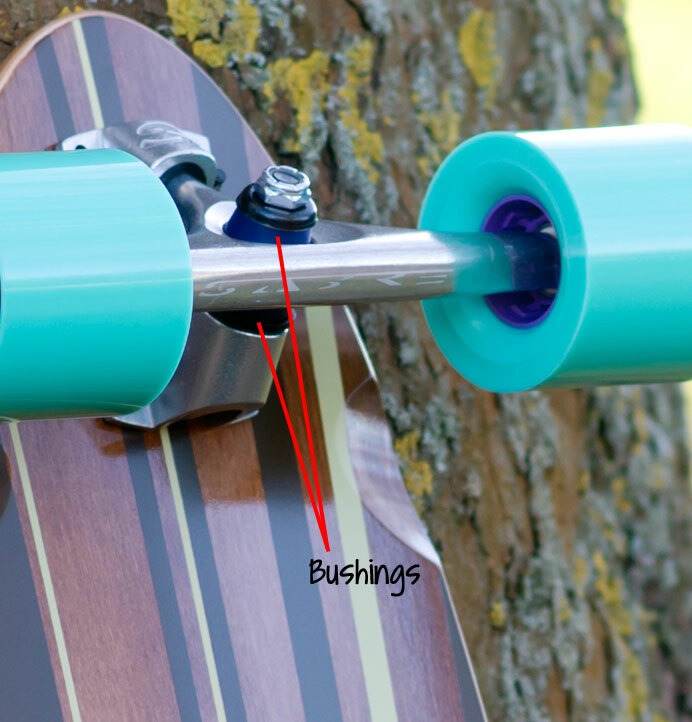 Whenever you buy a Lush Longboards Complete, we’ll give you the option to take an extra set of bushings – FOR FREE! We give you a free set of bushings because it’s a simple way for you customise your board to suit your weight and riding style. Buy a Lush complete and you’ll end up with a longboard that’s perfectly set up just for you! What is a bushing anyway? Which bushings already come with my board? Our easy recommendation is to go with the same shape (SuperCarve, Carve, Speed) as you already have on your board, but go a bit softer. So if you have a Legend X-Flex Pro complete, which comes with F-Type 90A Carve Bushings (see table below) choose a pack of X-Type 86A Carve bushings. Or if you are ordering a Mako Elite complete, go for a pack of F-Type 90A Carve bushings. For even more turn consider going a couple of stops less, or even try switching to a SuperCarve Kit. If in doubt – get in touch! A Sabre X-Type 86A Carve Kit will make your board turn more. Our easy recommendation is to go with the same shape (SuperCarve, Carve, Speed) as you already have on your board, but go a bit harder. 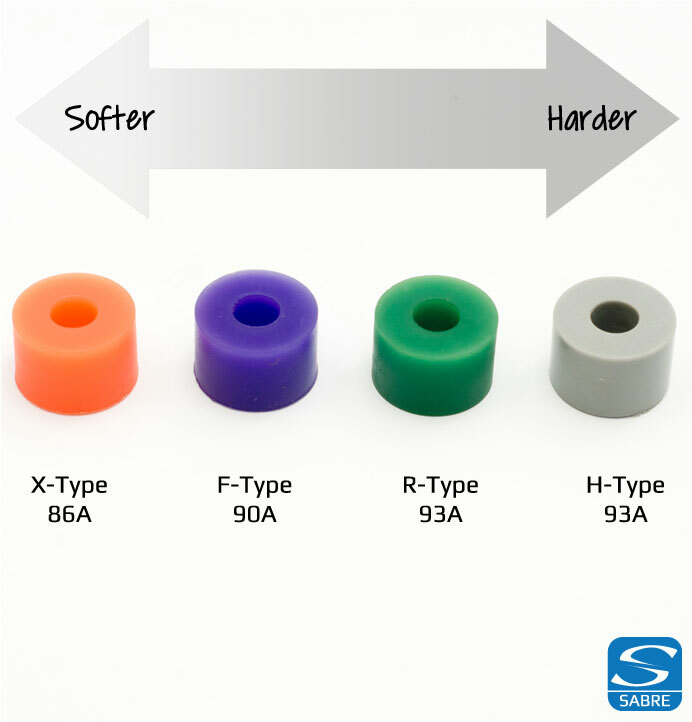 So if you have a Machine 3D X-Tuff Pro complete, which comes with F-Type 90A Carve Bushings (see table below), choose a pack of R-Type 93A Carve bushings. 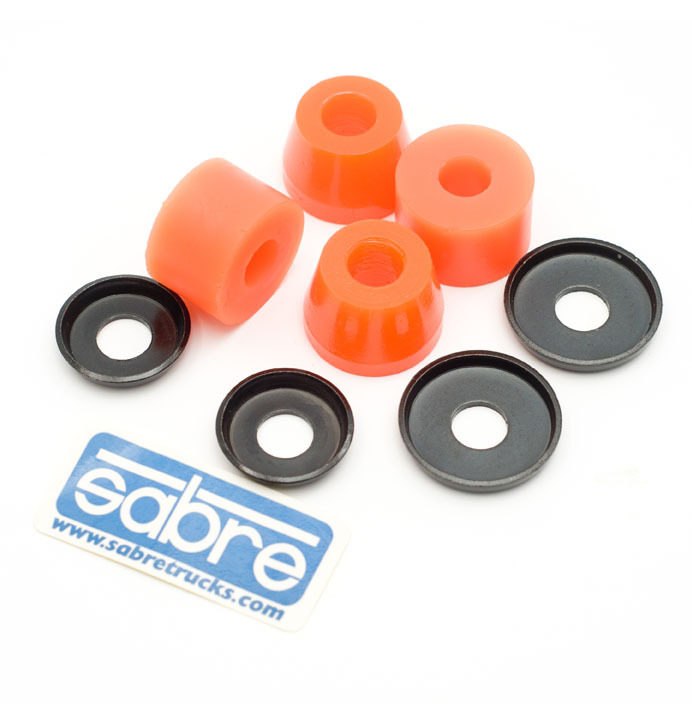 Or if you are ordering a Freebyrd Elite, go for a pack of H-Type 90A Carve bushings. If you are a real speed junkie, then consider going for a Sabre Speed Kit in a harder duro. Sabre's R-Type Speed Kit will get you epic stability! 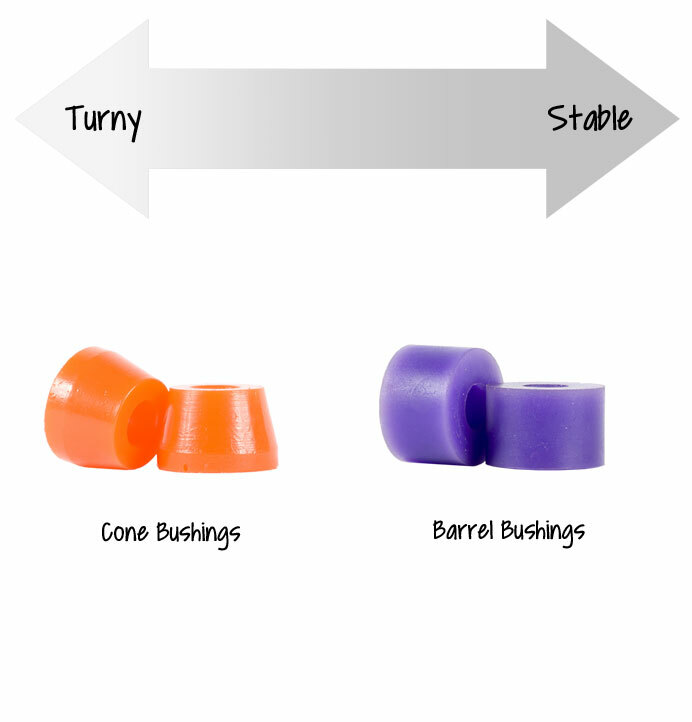 Bushings are the small urethane bits of your truck that do all the turning. By changing the shape and hardness of your bushings, you can make your board turn more, or make it more stable. You can also affect whether your board gets wheelbite or not. Harder bushings are more stable, softer bushings are more turny. A harder bushing has a higher durometer – eg 93A is harder than 86a. Conversely, softer bushings make your board turn more easily. The bigger the bushing, the more stable your board will be. So Barrel Bushings (more urethane) will give you more stability. And Cone Bushings (less urethane) will give you more turn. What bushings already come with my board? SuperCarve bushings consist of two Cone bushings per truck. We spec this when we want maximum turn. Carve bushings consist of one Cone and one Barrel bushing per truck. A good allround setup. Speed bushings consist of two Barrel bushings per truck. For maximum stability at higher speeds! 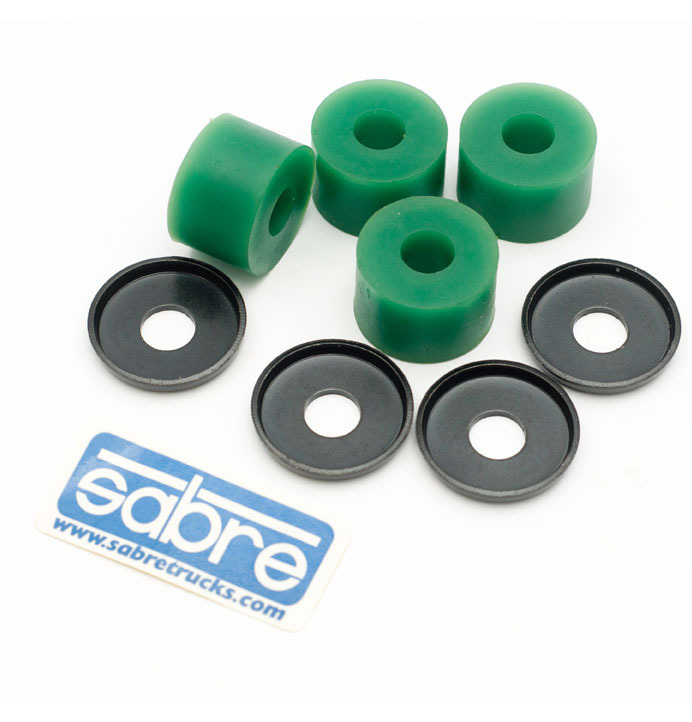 Check out the complete Sabre bushing lineup at sabretrucks.com.